STUNNING!! 5 Bedrooms, 3.5 Bathrooms & 4 Car Garage. Not a 55+ Community. Located on a private Cul-de-Sac lot & next to a greenbelt, this spotless home offers a perfect layout. Freshly painted exterior. You will love the incredible foyer & entryway that expands to a large staircase making its way to the second level. 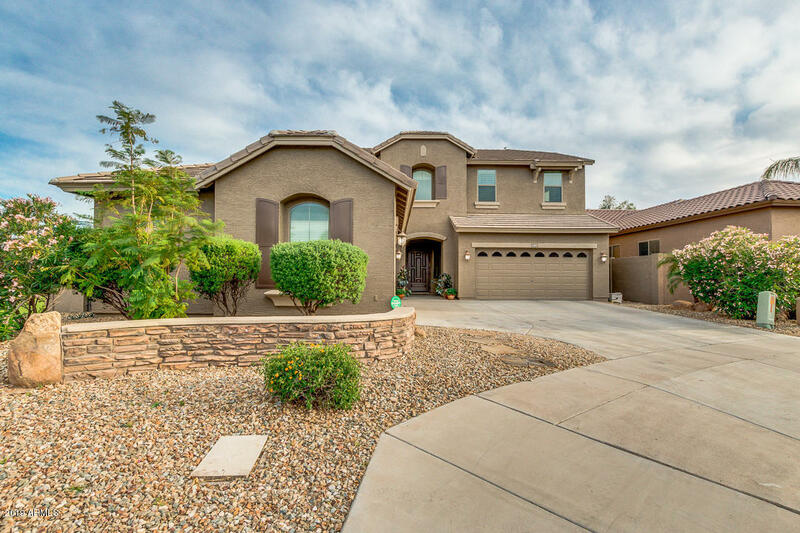 The lower level showcases a large formal dining & living room that leads to a large kitchen with an granite countertops, island, stainless steel appliances, dual oven, recessed and pendulum lighting, lots of natural light, tile flooring, eat-in kitchen & it's open to the family room. One bedroom and bathroom downstairs. Upstairs, you will find an impressive master suite, extra large walk-in closet, large bathroom, separate shower/tub. A large loft & additional bedrooms. The backyard is your personal & private paradise. The refreshing swimming pool, raised gazebo, mature landscaping & garden will impress you. The extended covered patio provides the shade where needed. Once you see this resort style home, you will be impressed.